Nutrient for alcoholic fermentation, based on inactive yeast, yeast autolysates and diammonium phosphate, to enhance the aromatic complexity of white and rosé wines. The balance between its organic nitrogen sources results in the production of more elegant wines, with more finesse, typicality and better balance in the palate. The glutathione-rich fraction of the formulation participates in the protection of the aromas formed during the alcoholic fermentation. Ensures a consistent and complete alcoholic fermentation when facing light to moderate nitrogen deficiency in juices and must. 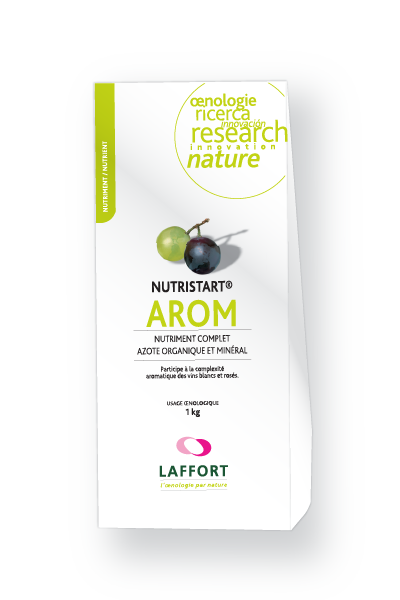 In the case of high nitrogen deficiency or potentially high ABV, complete NUTRISTART® AROM with a mineral nitrogen source, in order to guarantee sufficient nutrition to yeast. The amount of available nitrogen needed should be determined according to the potential ABV of the must. For a successful fermentation, the richer the must is, the higher is the nitrogen dosage needed, as well as other growth factors.